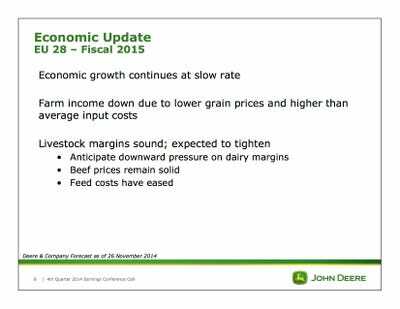 On Thursday morning, John Deere reported fourth quarter earnings and revenue that beat expectations. In the fourth quarter, Deere reported earnings per share of $US1.83 on revenue of $US8.9 billion, topping estimates for $US1.57 of earnings on $US7.75 billion of sales. But when compared to the prior year, the company’s earnings and revenue both declined, and Deere doesn’t expected that trend to abate in 2015. 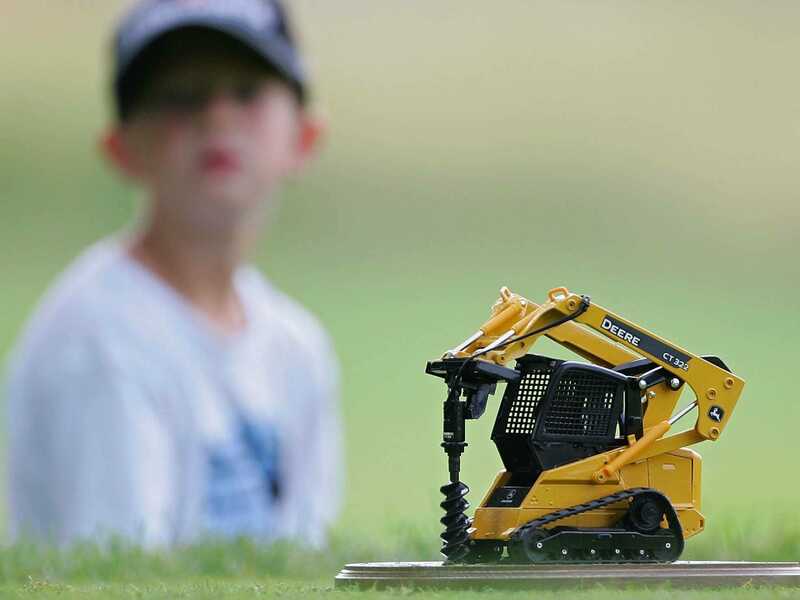 Deere expects sales decline in its equipment segment, as well as its agriculture & turf segments in 2015, thought the company is looking for a modest increase in sales in its construction and forestry segment. The company, which has its finger on the pulse of most all parts of the agricultural and industrial economy, released a slide deck to accompany its fourth quarter earnings conference call, and its outlook for the global economy isn’t great. 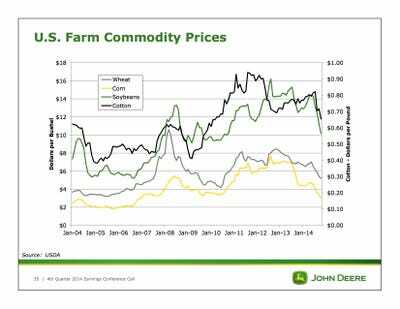 Deere expects commodity prices to continue falling next year, a trend that has been in place for most all of 2014, and the company sees China and Europe continuing to grow at just a modest pace. 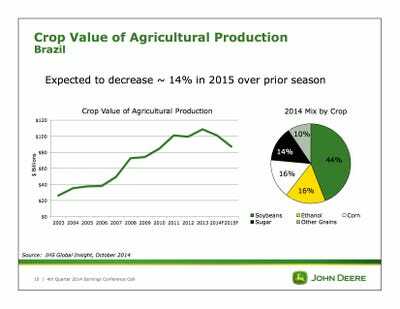 And the company’s most negative view is on Brazil, where Deere expects the crop value of agricultural production to decline 15% next year. The European economy is still just so-so. 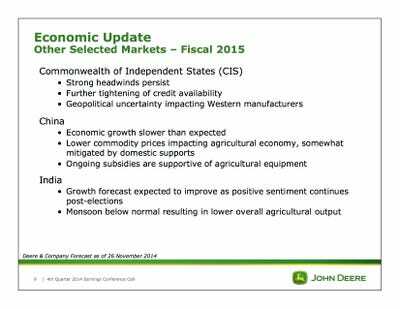 Chinese economic growth is also slowing, with lower commodity prices impacting the agricultural economy. The outlook for Brazil is particularly grim. 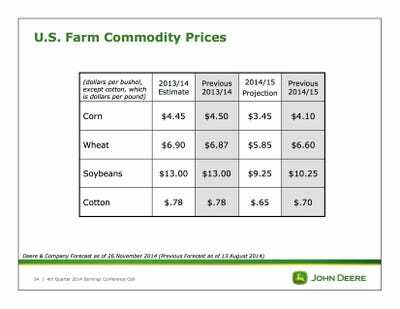 Deere slashed its expectations for the price of all US farm commodities. 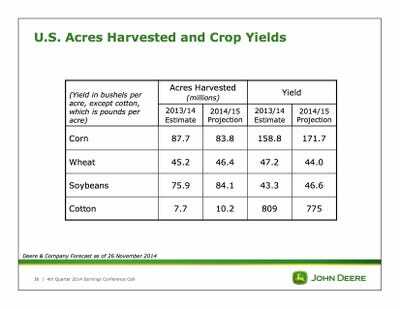 But 2015 should have a better corn crop, with fewer harvested acres and a larger yield. 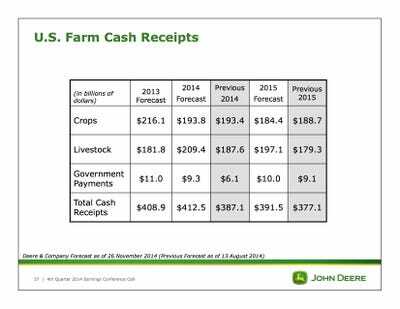 But corn is the only commodity that is expected to see revenue increase in 2015.